The Informal Northern Thai Group provided the forum for Shane K Beary of Track of the Tiger to present his ‘Proposal to Redevelop and Reposition Chiang Mai for Tourism’ to an audience that looked convinced by the end of the discourse. The question and answer session highlighted the fact that most foreign residents were convinced that the cosmetic changes, and attractions currently planned for the city would fall far short of what is needed to achieve the government’s stated objectives in terms of improving the city for both residents and tourists. Most also agreed with the assumption made by Shane Beary, that Chiang Mai’s infrastructure, pollution, and other cheap destination related problems would only be overcome when the big investors (private or public sector) were onboard a plan for change. To get them onboard, they must be shown a plan that was workable, and promised a high return on investment. Several senior government officials, key tourism industry players, and heads of tourism and commerce associations who have read the proposals responded positively. 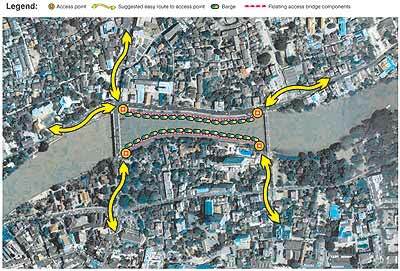 Establish a 3 km long 6 meter wide floating walkway, ideally along both sides of the river as it runs through the heart of the city. Using modern technologies, moor environmentally friendly river barges of a classic ‘rice barge’ design, as shops, cafes’ and entertainment venues along the length of the floating walkways, creating a ‘unique selling proposition’, the Ping River Market. Turnstile type entry gates to each end of the floating walkway would facilitate entry fee collections. The turnstiles would also allow the venue to be properly policed in terms of overall safety, and with regard to the control of underage drinking/drug use/prostitution etc. By having some barges double as stadium styled seating units, (on a part time basis) the entire floating market complex can become a special ‘venue’ hosting floating parades, Loy Krathong, Songkran and many others to be created, all capable of generating huge revenues for the city if properly managed and policed. Establish ‘park and ride’ stations 2 km distant from each corner of the ‘Ping River Market’. Use a combination of financial incentives and social restrictions (soft loans, early closing hours), to entice tourist related businesses to relocate from the city center to the new Ping River Market. Have the developer/government design and build some of the barges and lease them out to potential clients ensuring a good business mix. Provide solid argument as to the business sense in being located in a ‘promoted area’ as opposed to one ridden with access and pollution problems. Redevelop the ‘reclaimed downtown areas’ converting ugly buildings into three or four floor parking garages, banning roadside parking and turning pavements into tree lined promenades. These buildings can then become either owner operated or leased boutique outlets, sidewalk cafes, and accommodation clusters where perhaps three or four boutique style hotels share common public areas and restaurant facilities. Step 5. –Make Chiang Mai a regional arts and crafts center for the Greater Mekong Sub-region. Bring in raw, semi-finished, and finished product from China, Burma, Laos and Vietnam. Bring in craftsmen and artists from all over the region and establish product research and development centers, art schools and colleges in Chiang Mai. Fund the training and RandD programmes with scholarships with revenue provided by toll gate access to the river market. Re-invent the handicrafts industry, inject creativity and build a new export market on the re-branded products. Step 6 – Upgrade and extend the tourism product to cover the low as well as the high seasons. Develop the higher altitude areas in the hills/mountains around Chiang Mai into ‘all year round’ long stay resorts, health retreats and spas, golf courses, back to nature hill stations. These products to be target marketed at the more affluent tourist, the meetings and incentive business, and the retiree market. Step 7 – Upgrade the promotion and marketing of Chiang Mai. Establish a ‘Promotional Bureau’ for Chiang Mai, funded by toll access fees, tourism taxes, and rent revenue from river barges. Use the Promotional Bureau to promote Chiang Mai the city, its universities, its culture, its export product, a retirement or long stay destination, its IT industry, its agriculture and its aspiration to become a hub for the GMS, to the world. Valentine’s Day is the day for lovers, and a wonderful date to be married. You can now have a Lanna style marriage on an elephant’s back, thanks to the Tourism Authority of Thailand TAT), the Elephant Institute in Lampang (under the patronage of Her Highness Princess Kallayaniwattana), and the Lampang Forest Industry Division. This event aims to both promote Thai tourism and enhance Lampang’s reputation among foreign tourists and to preserve Thai-Lanna traditions. To sponsor loving relations, the Lampang governor is, for the fourth time, inviting couples to get married on an elephant’s back. 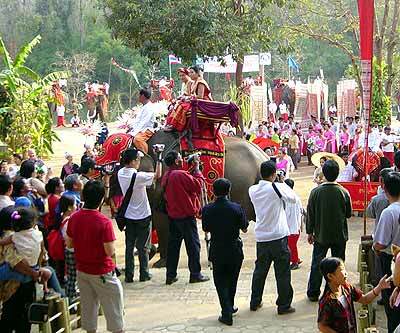 In 2005 the ceremony will fall on Valentine’s Day and be held at the Thai Elephant Camp Center on Chiang Mai–Lampang Road, Lampang province, from 2 p.m. until 9 p.m.
Whilst not an ancient ritual, marriages on an elephant dates from when a Japanese couple who worked as volunteer mahouts at the Lampang Elephant Center in the last century. Impressed by their charges, they decided to hold their marriage on an elephant. It is believed that they were the first couple to do so. Now TAT and the Lampang Elephant Camp Center helped to preserve the tradition. Interested couples can ask for more information at the TAT northern region, Chiang Mai (053 248 607), or the Lampang Elephant Camp Center (054 228 108). Numbers are limited and the brides and grooms must register and learn elephant language for two days at the camp to familiarize the animals with them. In one of the most attractive marriage events in the world, This Lanna marriage tradition features a two kilometer long procession that first goes to the bride’s home to ask for her parents permission. After the wrist binding ceremony, the brides will be sent to their grooms on the elephants. The ceremony will end with the usual wedding party. European buyers have backed calls by Thai Hotels Association (THA) for Phuket hotels not to dump rates even though many are experiencing only 10 percent occupancy. Buyers interviewed say they expect a lull for Phuket, lasting at least six months to a year, not because travelers are afraid the disaster may happen again, but because they feel bad making merry in a place where so many lives were lost. The “impressive” turnout at the ATF is a sign all is not lost, says Berjaya Hotels and Resorts Division acting head, Lucinda Semark. She urged suppliers tempted to dump rates to invest in communications and offer value-added packages instead. “Just dropping prices would be negative for everybody and would hurt the recovery in the long run. We should get working on good multi-destination packages. Strategically we need to drive revenue by letting travelers experience things they would otherwise not experience. From now until March 31, 2005, Thai Airways International (THAI) is offering more special domestic fares for the Andaman Sun Sand and Sea package for passengers traveling with THAI in Economy Class to destinations in Southern Thailand. Vasing Kittikul, THAI’s Executive Vice President, Commercial, said this special promotion is in response to the Government’s policy to attempt to revive and regain the confidence of tourists traveling Krabi, Phuket, and Trang in the South, that were not affected by the recent tidal waves, as well as to restore public confidence in Thailand’s tourism industry. The promotions include: roundtrip domestic airfares from Bangkok to Krabi, Phuket, and Trang are 4,200 baht, 3,800 baht and 4,400 baht, respectively. Passengers from the North and Northeast to Krabi, Phuket and Trang will receive a 30 per cent discount from the normal fare. For more information, please contact Tel. 0-2628 2000 and 0-2280 0060. These special Economy Class fares (excluding airport tax and insurance surcharge) are available for flights departing from Bangkok, Khon Kaen, Chiang Mai, Chiang Rai, Pitsanuloke, Udon Thani, and Ubon Ratchathani to Krabi, Phuket and Trang via Bangkok. Passengers are able to make an overnight stop in Bangkok and must hold a confirmed one-way or return ticket. Royal Orchid Plus members may also accumulate mileage from this promotion. From now until 31 August 2005, ROP members who wish to travel to Krabi, Phuket, or Trang need only 12,000 instead of the usual 15,000 accumulated mileage in exchange for one-way travel in Economy Class. One-way travel in Business Class needs 16,000 accrued mileages instead of 20,000. For more information and reservations, please contact THAI’s Sales Office at Tel. 0-2628 2000 or 0-2280-0060 or visit THAI’s website at www.thaiairways.com. A tourism integration master plan for the Greater Mekong Sub region (GMS) is being developed by Asia Pacific Projects (APP). It includes the creation of a distinctive branding for the grouping, comprising Cambodia, Laos, Myanmar, Thailand, Vietnam and Yunnan, China. GMS wants a bigger slice of tourism in ASEAN; its partners to speed up tourism development include UNESCO, ESCAP, the World Tourism Organization and the Asian Development Bank. Arrivals to the sub-region are expected to rise from 15 million in 2004 to 47 million by 2015. A seven man APP task force, headed by its chairman and director, Ludwig Rieder, has been conducting meetings with the respective stakeholders to determine infrastructure and software requirements. APP’s marketing and product development consultant, Renton de Alwis, is attending ATF to gather feedback on how GMS can get its “rightful” place in the ASEAN framework. In this post-tsunami period, some tourists are still afraid of traveling to the south and have, instead, changed their destination to the north, especially Chiang Mai. Vorapong Muchaotai, president of Thai Hotels Association, Northern Chapter stated that cancellations were less than 1 percent because tourists had already decided on their destination. Package tour groups that cover many provinces in a trip around Thailand had some slight effect. 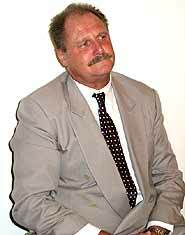 “The location of the city makes tourists consider it is safe from any danger or catastrophe. Business growth in the first three months could increase by 10 percent compared to the same period last year because more people in Thailand travel in the north rather than to countries in Europe. 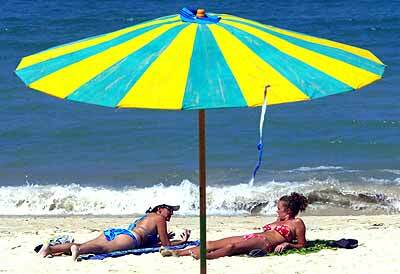 “Seaside tourism can attract Chinese or other Asian country tour groups. In the north, tourists from Europe are the main factor of tourism. New five star hotels have a high rate of room occupancy. It is a good sign that the big spending customers are now becoming interested in Chiang Mai. “The hotel association held a meeting with concerned government divisions and the nine airlines to cooperate with TAT to help eliminate the low season. Campaigns and activities are being planned during May – September. The highlights will be shown in the “All Events in One Basket” style, which will be promoted in road shows in Hong Kong, Taipei, and in Middle East countries. “An evaluation of the hotel business shows that as the service providers base expands, income may be around 40 billion baht this year since it was 38 billion baht in 2004 and 37 billion baht in 2003. According to the Chiang Mai Provincial Tourism Strategy, the target in 2008 is to reach 70 billion baht as the night safari will then be fully open. In summary, Chiang Mai tourism is moving slowly but never steps back,” Vorapong concluded. Thai Airways International (THAI) held a press briefing on its investments at the Suvarnabhumi Airport, chaired by Kobchai Srivilas, THAI’s Senior Executive Vice President, Corporate Planning and Information Technology Services Department. Kobchai Srivilas said that the Thai government plans to create a “new town” in the vicinity of Suvarnabhumi, with a policy for the Airports of Thailand to provide temporary housing for those who will be working at the Suvarnabhumi Airport. The Thai government also plans to build “Suvarnabhumi City” with a complete transportation system and all facilities. To that end, THAI signed an agreement with the Electricity Generating Authority of Thailand to be responsible for the re-location of THAI’s equipment to the new airport. Chokchai Panyayong THAI’s Vice President, Project Development at the New Bangkok International Airport said that as of 4 January 2005, the overall progress in designing and constructing THAI’s buildings is at around 75 percent completed, though some sections are trailing, with the Operations Center building only at 43 percent. The Cargo and Mail Commercial building is at 76 percent, Catering Services at 85 percent; Aircraft Maintenance Center at 80 percent and Ground Support Equipment Services building is at 76 percent. The construction of THAI’s buildings is scheduled to be finished by March 2005 for system testing and completed by 29 September 2005.